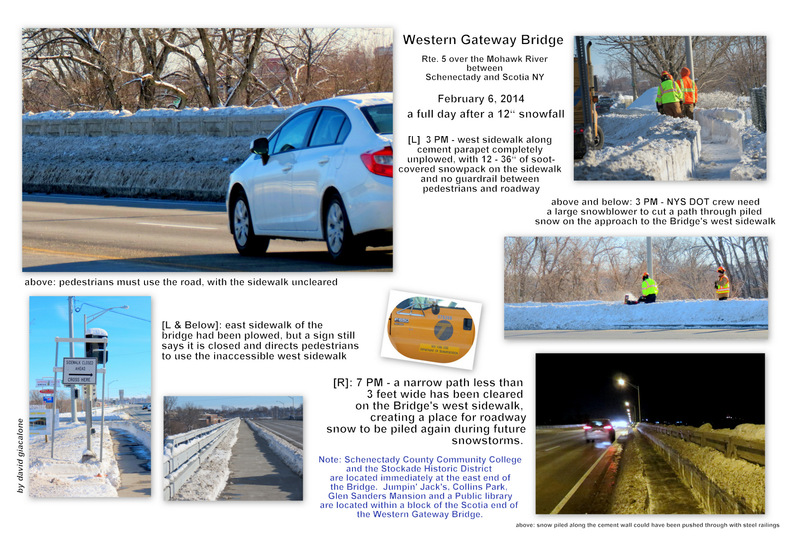 . . Editor’s Note: This posting has grown quite large, with many updates, as I learned more and more about the Western Gateway Bridge [“WGB”], the regulations and process at NYS Department of Transportation [“DOT”], and the actions and non-action of our local municipal leaders and planners. At first, I focused solely on the beautiful view lost when steel railing was replaced by a cement parapet, but as I learned more about the threat posed by the barrier-less sidewalks, I came to believe the Sidewalk Safety Issue was just as important and surely more urgent. 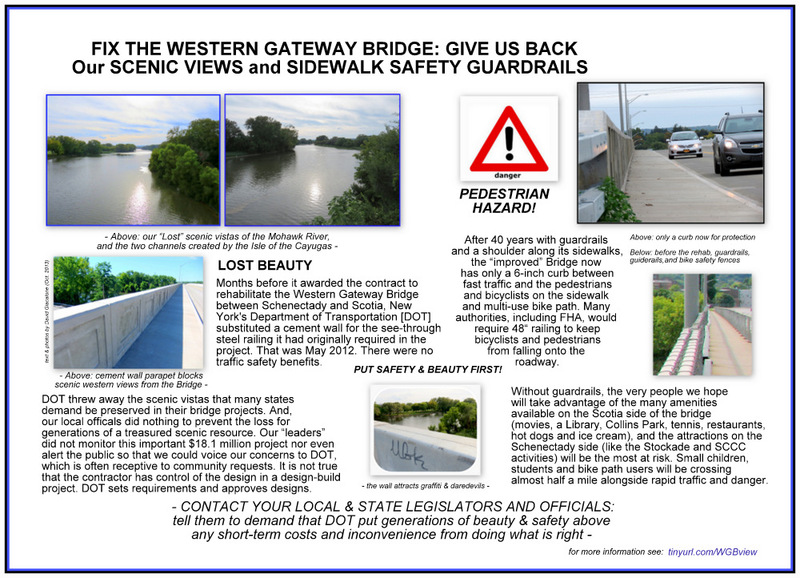 Click on the collage image to the right of this Note for a larger version of a 1-page flier summarizing the Lost View & Sidewalk Safety issues at the Western Gateway Bridge, over the Mohawk River, NY Rte. 5, between Schenectady and Scotia NY. 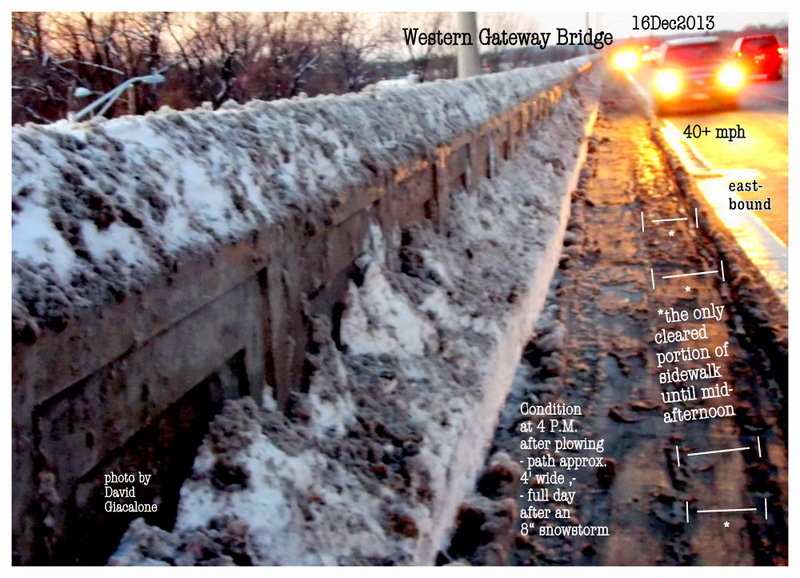 My Sunday Gazette View-Point piece “Loss of scenic vistas and guardrails on Western Gateway Bridge falls on shoulders of local leaders” (Nov. 17, 2013), which argues that there are no good excuses for local leaders letting DOT take away the WGB views and guardrails. new Rexford Bridge – Gaz. follow-up (May 2018): Our WGB safety-beauty campaign got no help from any of our local leaders, nor from the Stockade Association. The only success was preserving the less impressive eastward view from the Bridge, with thanks to a Gazette Editorial, described below. However, our efforts might have sensitized NYS DOT, as well as local pols and users of the old Rexford Bridge down the River. 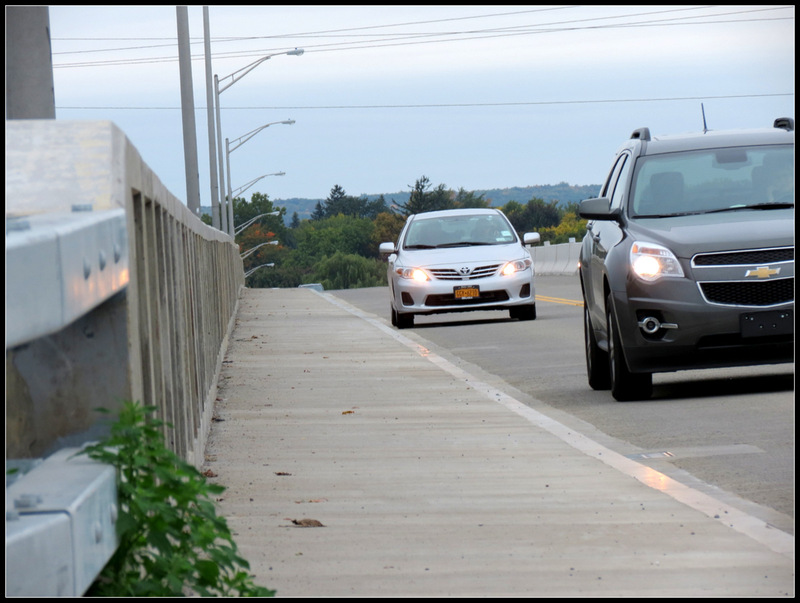 As you can see from a Gazette photo, by Marc Schultz, when the Rexford Bridge opened in November 2017, see-through steel railing on the bridge permits a view westward along the Mohawk River, and the shared-use sidewalk is both raised and protected by guardrails. Go here to learn about our [closed] WGB Guardrails Petition. . 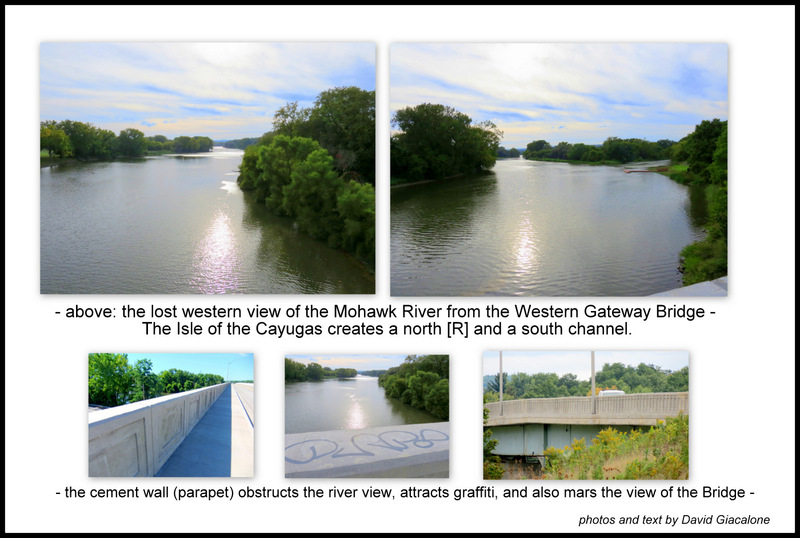 There is a lot of misinformation about how that cement wall (parapet) that steals our views of the Mohawk River ended up on the Western Gateway Bridge (Google map). This posting attempts to set the record straight, using readily-available public records (primarily from the webpage for the NYS Department of Transportation [“DOT”] Accelerated Bridge Program, Phase 1B Zon 1 Contract). I hope you will be motivated to let your local leaders and Legislative representatives know you want your scenic treasure back, along with guardrails to protect pedestrians and bicyclists from fast-moving traffic that jumps or rolls over the curb or — more likely — that they fall into by accident or are forced into when interacting with other sidewalk users. DOT Required the Cement Wall Months Before the Contract was Awarded. DOT mandated the cement wall as early as May 2012, during the bidding process, three months before Kubricky was awarded its contract. See Addendum No. 4 and Addendum No. 5 to the Project Requirements document. Our local leaders did nothing to stop the wall or even alert the public so that we could voice our views about the loss of a treasured scenic resource. We Gained Bike Lanes and Lost Scenic Vistas & Guardrails: The original Project Requirements announced on April 11, 2012 required a (see-through) four-rail steel railing. Our local newspaper and others immediately asked why there were no shared-use lanes and no mixed use bike-pedestrian pathway. In response, on May 11, 2012, at the same time it changed the bridge requirements to create two multi-use lanes and a wider path for pedestrians and bicyclists, DOT amended its plan to instead require a cement wall and barred the 4-steel-rail alternative; it also said that no bicycle fencing need be placed above the parapet to prevent bicyclists or pedestrians falling off the bridge. The issue of pedestrian guardrails was not mentioned in either the original or modified bridge requirement memos. DOT has also said the multi-use changes were not the cause, and I think we have to take the agency at its word. 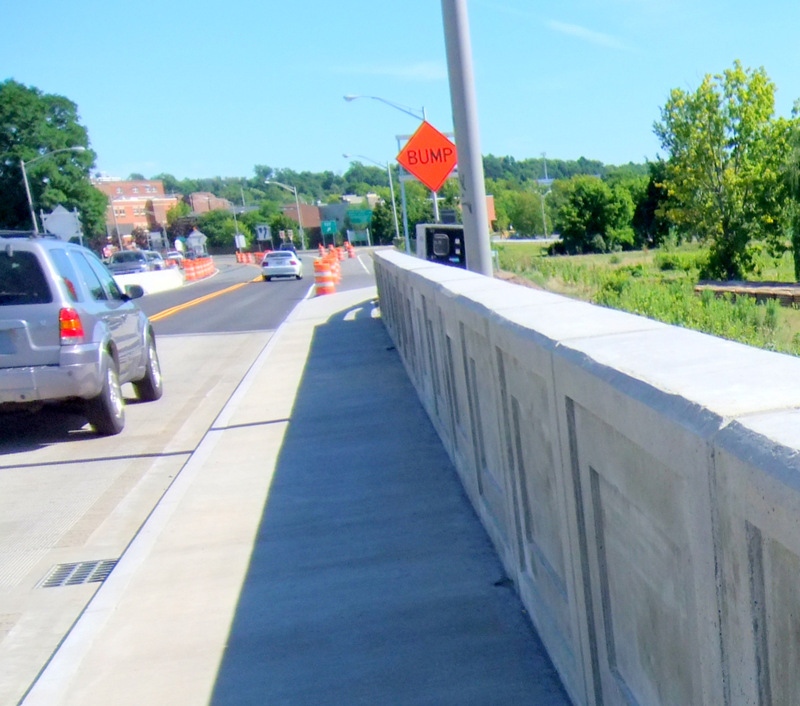 DOT spokesman Bryan Viggiani told a Gazette reporter in an email: “In conjunction with the change [adding the multi-use lanes and path] the decision was made to make the barrier decorative, rather than the standard four-beam steel bridge railing. Local leaders were not made aware of the change in barrier plans at the time, he said.” (“Western Gateway Bridge has roots in early 1800s“, Sunday Gazette, by Kelly De La Rocha, November 3, 2013; also see Gazette editorial, “DOT must do more about lost bridge view“, September 12, 2013). 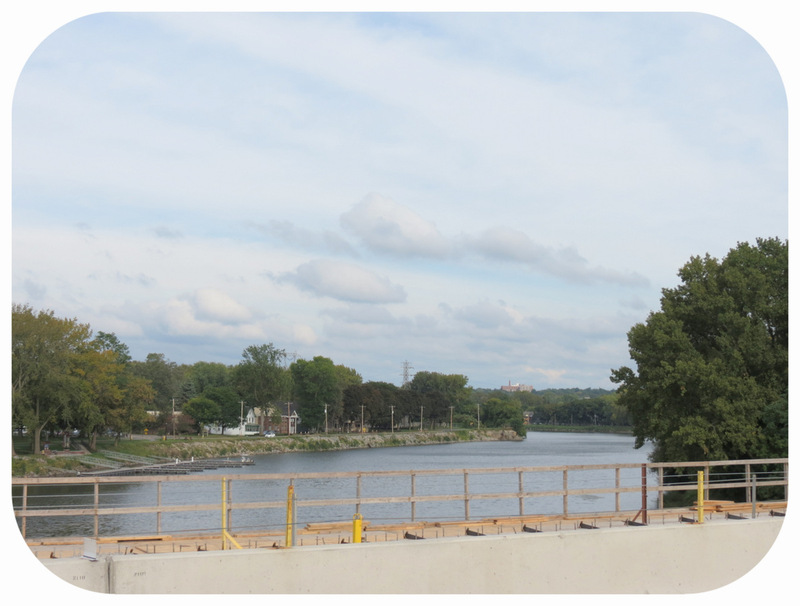 For most of us, it is surprising that DOT believed a “decorative cement barrier” was an aesthetic improvement over standard beam railing that allowed a beautiful view of river and forest, or that a cement parapet was a better option than merely using more attractive steel railing. Nevertheless, the fact that the switch was seen as a decorative-aesthetic bonus, rather than a cost-cutting or safety measure, indicates that an early public outcry over losing the view might very well have received a positive response from DOT. l had originally thought that the switch to the cement parapet was probably a fiscal or engineering and safety tradeoff due to the incorporation of multi-use lanes. That is apparently not the case. For example, the Bridge’s new configuration, with the wider multi-use lanes, did not require a wider deck; instead, the deck is actually four inches narrower than before the multi-use lanes were part of the design. Because the switch was instead due to an aesthetic judgment that clashes greatly with the feelings of the community, I also believe continued advocacy to salvage the beautiful western view may be effective, especially when coupled with the need to better protect sidewalk users. Dollars and delay seem a comparatively small price compared to restoring a rare scenic view from an urban bridge and traditional sidewalk safety measures. Local Leaders Should Have Known and Acted. The documents requiring the cement wall, plus a sample photo of a cement wall, were immediately posted at the DOT site in mid-May 2012. County, City and Town officials should have been monitoring this important, $18.1 million project for such changes. Whether or not there were formal communications between DOT and local jurisdictions, our local leaders were sufficiently “in the loop” to know in April 2012 that the original configuration had no new multi-use lanes, and then, in Mid-May 2012, to tout their role in convincing DOT to add the requested lanes and bike path. Local officials tell us now that DOT never directly told them about the change and they never thought to ask about railings and parapet barriers. But, such monitoring should have been an obvious obligation for “planners” and representatives of local residents. Indeed, DOT advises at its Accelerated Bridge Program [ABP] information portal: “Visitors are urged to check the website regularly, since changes are possible.” The agency makes that task quick and easy to accomplish through its ABP webpages. Their informative website was surely implemented so that “stakeholders” in all sectors could keep informed about the process and progress of a particular project. An Important and Obvious Lesson: Design-build transportation projects call for more, not less, monitoring against safety, aesthetic and environmental threats. The lack of public participation in the process is not an excuse for local officials to do nothing; it should instead make local officials, especially planning officers, more alert to changes in order to protect the public interest. That is especially true because DOT has customarily shown a willingness to listen and respond in positive ways to community concerns and preferences. The public deserves to know who knew about the substitution of a cement wall, and also about the decision to eliminate sidewalk guardrail protection, but decided they were acceptable and/or not something they need not tell the public. If somehow our planners and leaders were oblivious to the loss of vistas and guardrails, we need to know who failed to find out that crucial information and why. The View Eastward is Saved: The DOT decisions about the eastern edge of the Bridge are instructive. 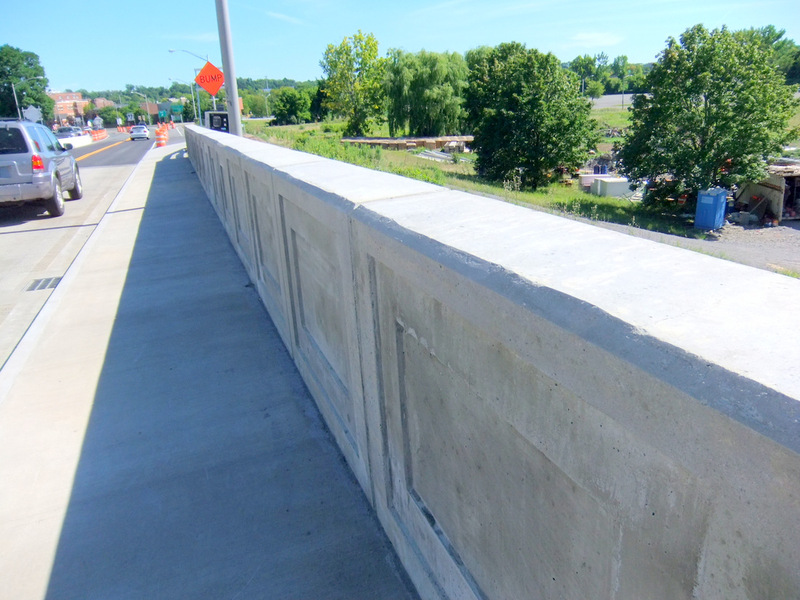 As with the western side of the WGB, DOT first required a four-rail steel railing but then changed to a cement parapet in May 2012. 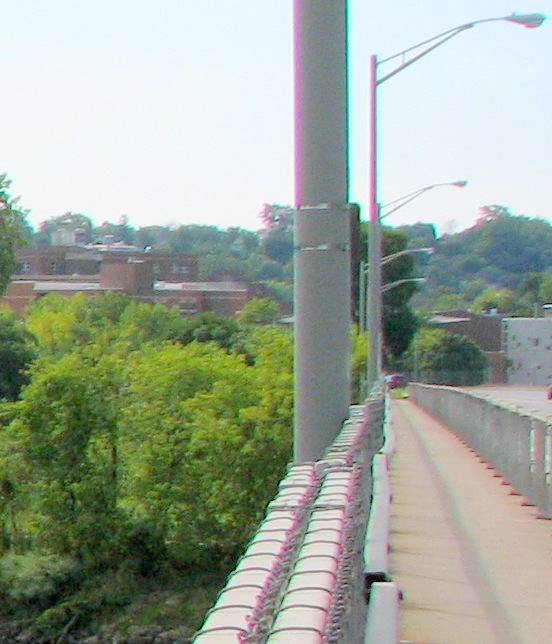 However, on September 8, 2013, within a few days of a public outcry and Gazette editorial about the cement wall and loss of scenic views, DOT announced that the eastern view will be preserved by installing a steel railing rather than the cement wall; the cement wall would, nonetheless, remain on the west side of the bridge. 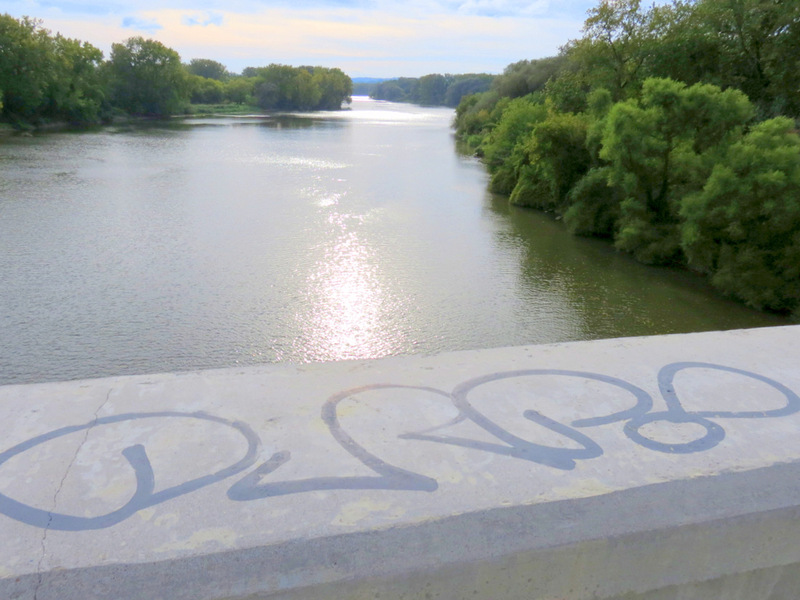 (see Daily Gazette, “View from Western Gateway Bridge partly preserved”, Sept. 9, 2013). The speed of this concession clearly shows that DOT has no concerns that providing a scenic view is somehow a safety hazard, which is a specious argument being made now by some local officials and apologists. In addition, DOT’s claim that the see-through railing is being provided on that side to give a better view to bicyclists and pedestrians makes no sense: bicyclists and pedestrians (all except the tiniest) can readily see over the cement wall; it is drivers and passengers in conventional vehicles who cannot. Clearly, the community’s complaints led DOT to salvage the eastern views of the Mohawk. (See Gazette editorial, “DOT must do more about lost bridge view”, September 12, 2013) Such responsiveness is admirable and underscores the need for earlier and continuous community input, through public comment periods or the vigilance of local officials. 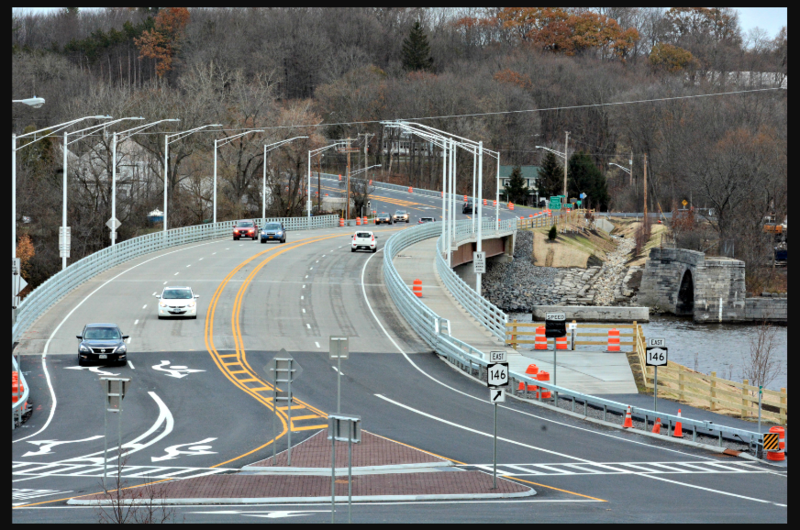 (Dec. 13, 2013) No Good Reason for the Redesign to Leave Out the Guardrails: The lane from Schenectady to Scotia is still being constructed going well into December 2013. When the plans for WGB were redesigned in September to include the steel railing that would preserve the eastern view, it should have been obvious and easy to also include a separator guardrail between the sidewalk and the roadway. 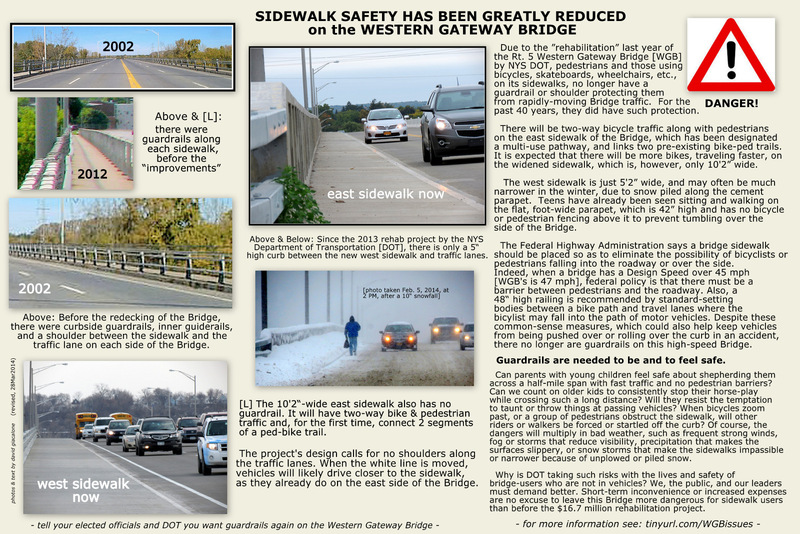 Many members of the public asked for this safety measure, and our local leaders should have been making the argument that without guardrails those using the sidewalk would be in more danger than with the pre-rehab configuration of the Bridge. Unfortunately, DOT seems to be arguing that the old guardrails were there to protect vehicles, by reducing the number or severity of collisions with the outer railing. The protection of pedestrians and bicyclists was an unintended benefit of the guardrails, is their apparent argument, so that losing that protection is not an important design issue for the project. DOT made that argument earlier this year about a bridge in Troy. See the Times Union Advocate column for June 6, 2013..
Cong. Paul Tonko: phone his Washington DC office [202-225-5076] , or his main district office [518-465-0700] and/or email the Congressman using his website email form. . . and, see the 2011 Google Map “street scene” of WGB . Go here to learn about our WGB Guardrails Petition. .
SIDEWALK SAFETY JEOPARDIZED: The WGB rehab project has no guardrails or shoulders between the sidewalks and the travel lanes, putting bicyclists and pedestrians at risk of falling into high-speed traffic or having traffic jump or roll over the curb in an accident. For the past four decades, sidewalk users were protected by both a shoulder along the road and pedestrian railing. Click the collage above for photos and discussion of this important issue (or click here). . . west sidewalk . . . . . 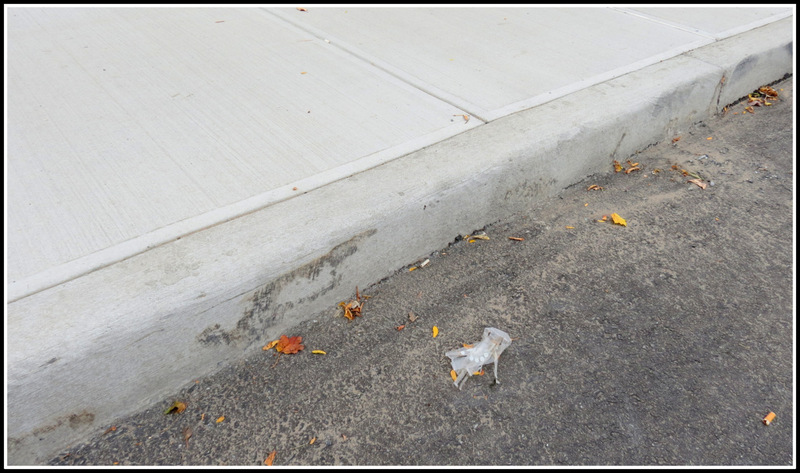 Failing to provide a barrier between the sidewalks and the roadway fails the test of common sense and is contrary to widely-recommended and mandated standards. The Final Design Report for the WGB project shows that the Bridge is being rehabilitated to a “Design Speed” of 47 mph (its posted speed is 40 mph).. The national consensus is that any design speed over 45 mph constitutes a “high speed” bridge, warranting extra protection for pedestrians and bicyclists. Whereas a barrier curb may suffice for low speed applications, Federal Highway Administration policy is that “A bridge with a design speed above 45 mph is considered a high-speed facility, and it must have a separator railing if pedestrians use it.” (See Bridge Railing Manual, Texas Department of Transportation, at 5-2, May 2013.) 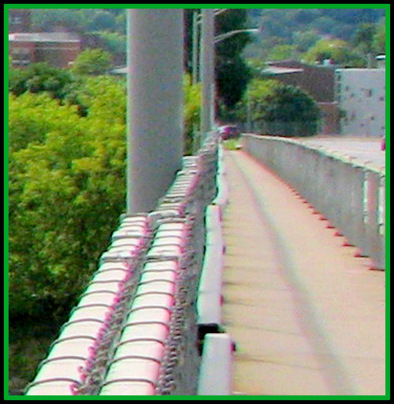 FHA has also stated that “Sidewalks on bridges should be placed to eliminate the possibility of falling into the roadway or over the bridge itself.” In addition, the ASSHTO guide for bicycle facilities calls for a “physical barrier or railing” when there is less than a distance of 5 feet between the bike path and a roadway. A major bridge may well be the only available crossing point for pedestrians – in which case, they will be forced to use the facility in an unsafe manner, it that is all that is made available for them. Keep in mind that a bridge project represents what may be the only opportunity to provide or upgrade pedestrian facilities on a bridge for a significant time period. As such, it is essential to provide the safest accommodation for pedestrians that can reasonably be made. 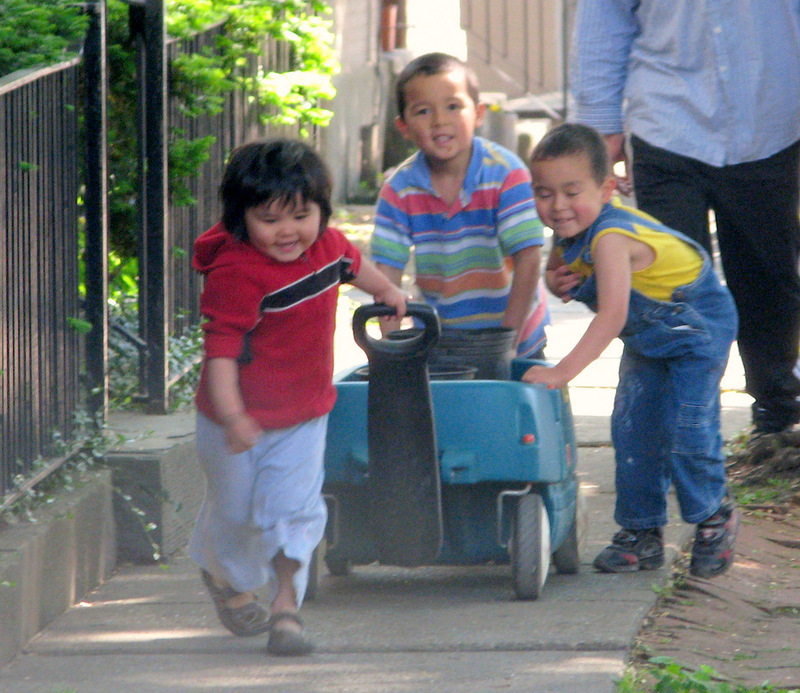 The young families and children that we hope will increase their use of the bridge to reach the amenities in Scotia, and the adults who may use the Bridge to reach the Stockade Historic District or SCCC, or to take advantage of the connected bicycle pathways, are more at risk because of the rail-less reconfiguration of the Bridge. Given the community outcry, it is surprising that barriers were not put back into the WGB design when the plans were changed in May to again use steel railings on the Scotia-bound side of the Bridge. If Director Zhou is right that “safety is the top priority” of the Department, sidewalk users must again be protected with sidewalk guardrails. pedestrians usually have a place to step away from the road when on a street sidewalk. pedestrians on WGB are more likely to need to avoid speeding bicycles than on city sidewalks. 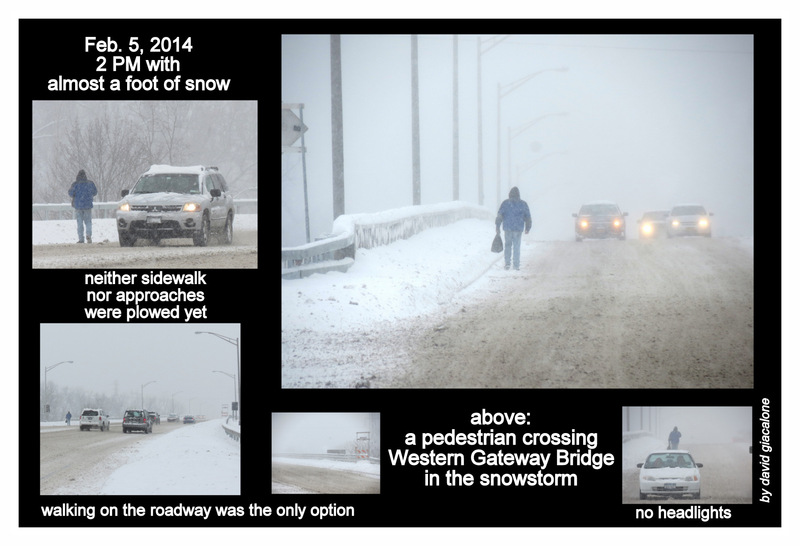 Things were even worse for pedestrians on the bridge on February 5 (see photo above), as there had been no plowing at all of either sidewalk at 2 PM, despite 10 to 12 inches of snow, forcing pedestrians to walk about half a mile in the slippery roadway in a strong wind, with very poor visibility. 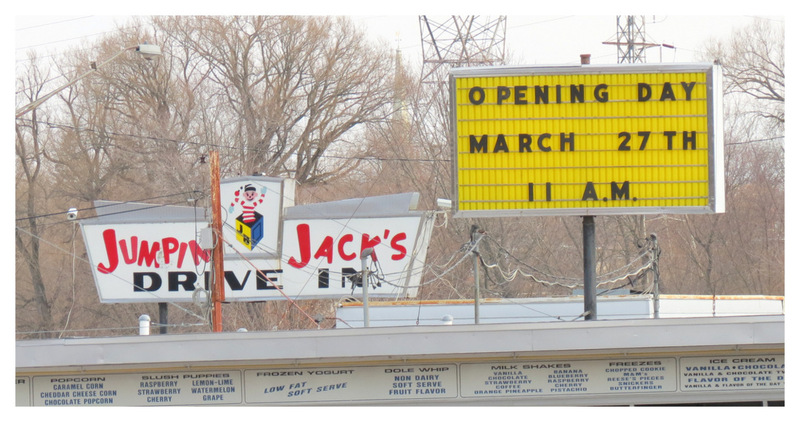 (March 26, 2014): Jumpin’ Jack’s opens tomorrow, and for many it means Spring is here, a time to head from Schenectady to Scotia on foot or bicycle, making the problem of dangerous sidewalks on WGB far more urgent. 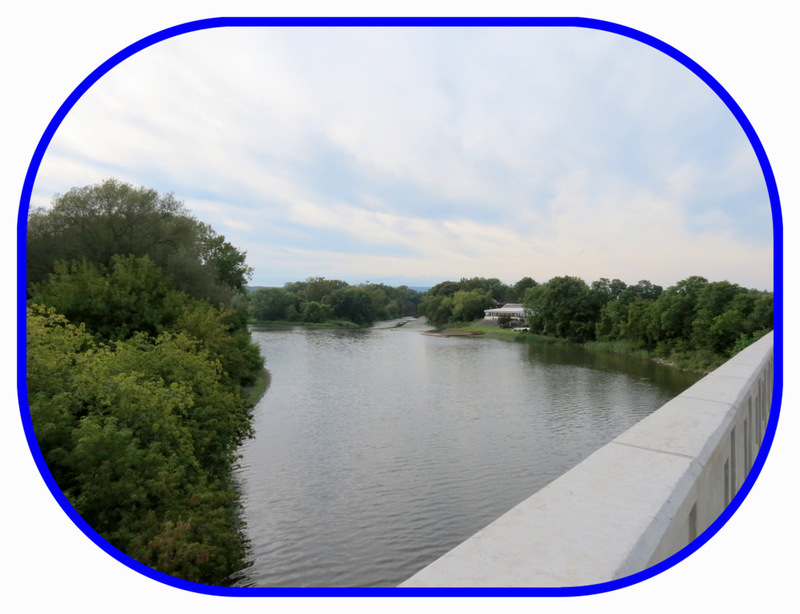 Click here, or on the collage immediately below to see how close the Bridge is to some of the amenities that bring families, couples, groups of kids, and singletons of all ages to that part of Scotia. For example: Jumpin’ Jack’s and Collins Park are directly at the end of the Bridge; the Scotia branch of the County Library is one block away, and downtown Scotia two blocks away.
. Winter was tough on anyone who needed to cross the Western Gateway Bridge on foot. 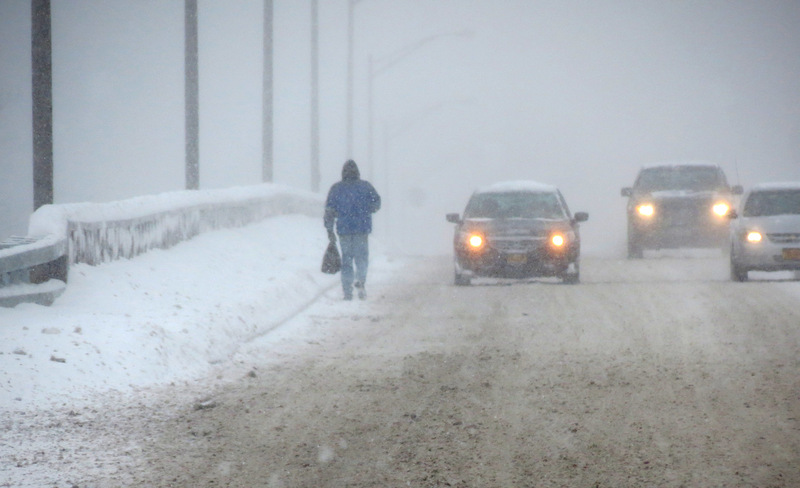 An often-frigid winter, with what seemed like nearly-constant high winds, and significant snowfall (causing blocked sidewalks and poor visibility), often made trudging across the Bridge an ordeal. 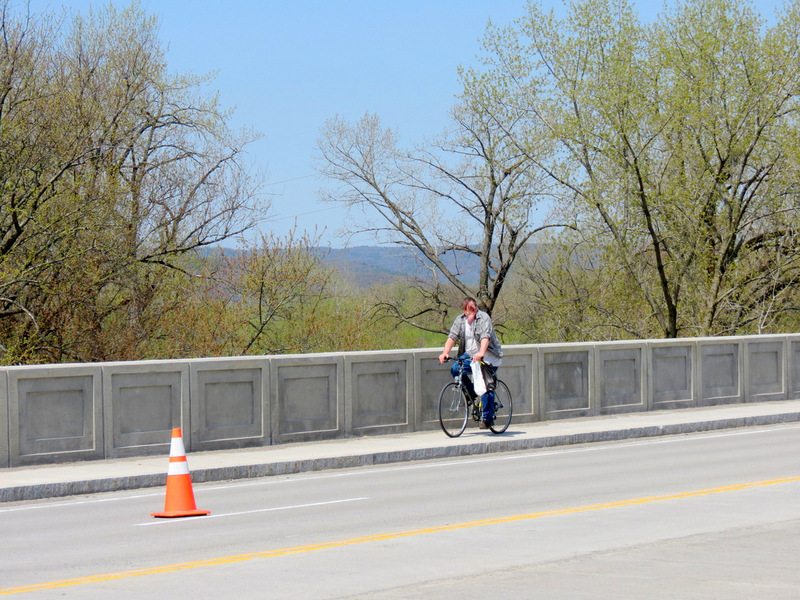 But, the coming of moderate Spring weather means many more people will be crossing the Bridge by non-motorized means: walking, bicycling, being pushed in a stroller by a parent, skateboarding, or using a wheelchair to get across. 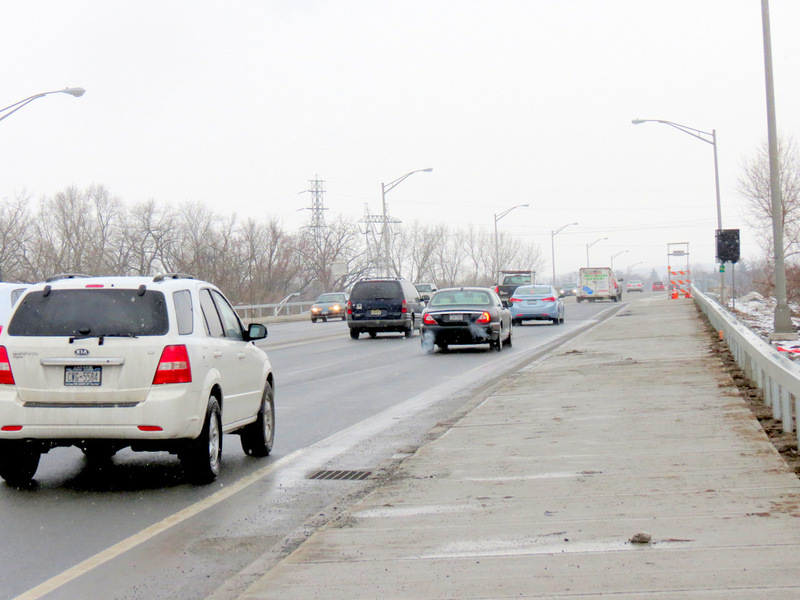 Publicity for the now-linked bike-pedestrian pathway on WGB’s east sidewalk between Schenectady and Scotia is expected to lure significantly more bicyclists. They will ride in both directions on that one, 10’2″-wide sidewalk, sharing it with pedestrians, and tempted by the smooth, slightly wider sidewalk to pedal faster. Some may choose to use the 5′-wide west sidewalk, rather than the wider “bike path”, and there are no signs prohibiting bikes on the west sidewalk.even if signs are erected prohibiting bikes on that side. Where can pedestrians or baby strollers go when confronting cyclists on the west sidewalk? Those crossing the Bridge, by whatever means, will be of varying ages and levels of maturity, vigor, and social responsibility. The opportunity for mishap or misadventure to cause a sidewalk user to fall into Bridge traffic will be much higher than it had been the past 40 years, when pedestrian fencing and railing, plus a narrow shoulder, separated the roadway from the sidewalks. 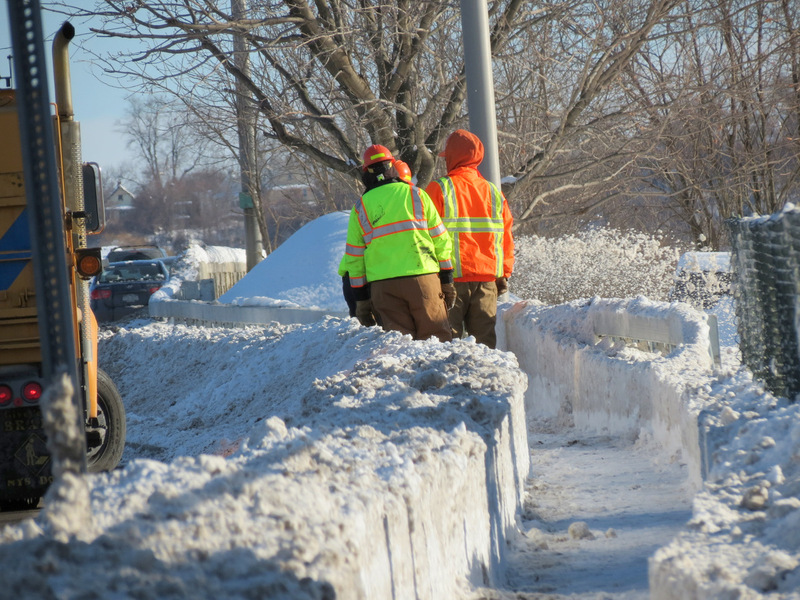 It is time to seriously lobby our leaders and NYS DOT to put up guardrails, adequate fencing or other barriers to protect those who use the WGB sidewalks. It would be a crime, if Jumpin’ Jack’s huge fireworks display arrives on June 28, and the sidewalks have not been made as safe as possible. 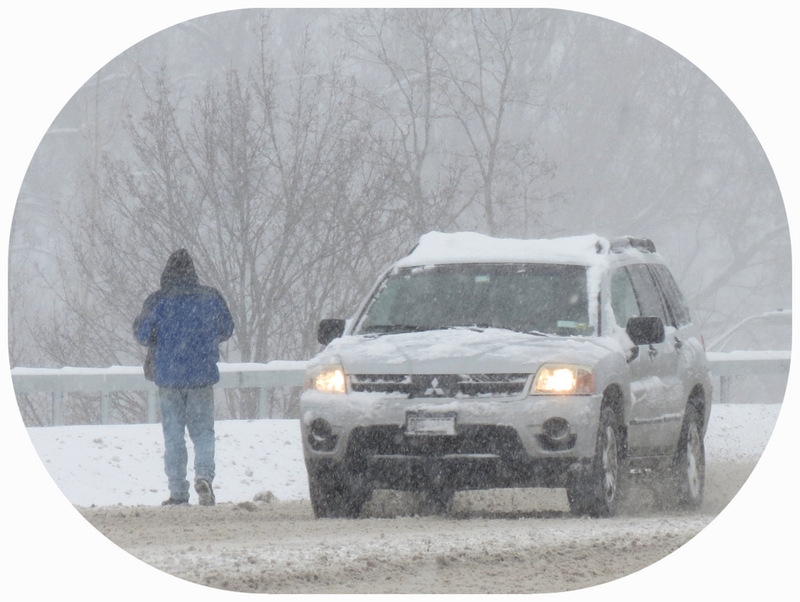 HELP (March 25, 2014): Please ask Congressman Paul Tonko to help restore sidewalk safety at the Bridge. Ask him to help get the Federal Highway and Administration and US DOT actively involved, in order to have New York’s DOT restore pedestrian guardrails to the Western Gateway Bridge. Say you’d like it done before Jumpin’ Jack’s fireworks on June 28, 2014.
and/or email the Congressman using his website email form. Scenic View as Traffic Hazard? : Some observers have stated that drivers should watch the road, not the scenery, so we should not complain about the cement wall now blocks the western view of those on the Bridge’s roadway. See-through railing is everywhere on bridges, especially the most famous bridges and those with a beautiful view. Many states (e.g., Texas and California) have specific policies or laws in place encouraging the preservation or enhancement of scenic views from their bridges. I’ve found no information showing that a scenic view is a driving hazard. And, of course, “passenger cars” have passengers who are not driving and should be allowed to fully enjoy the vistas. 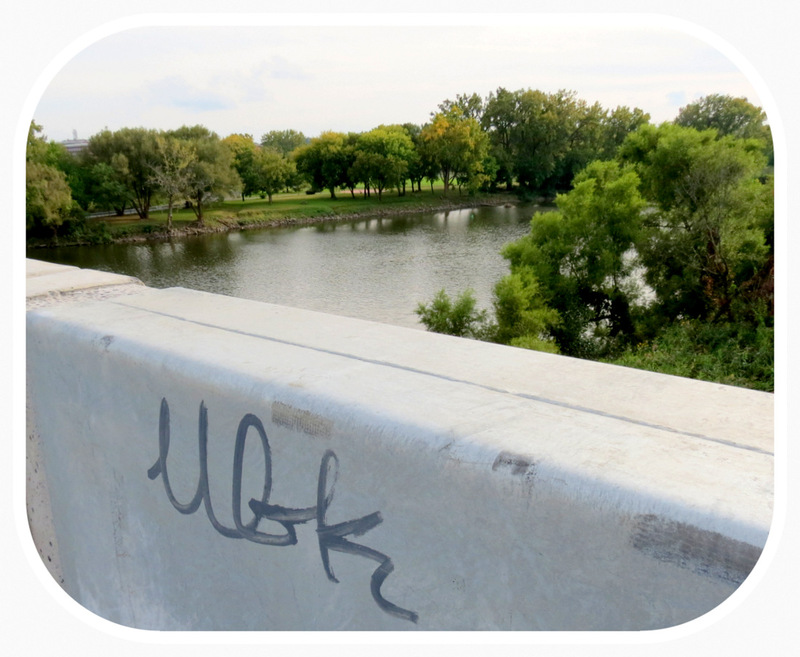 No one is encouraging long, languid gazing by drivers along the Mohawk. Whether on a bridge or a road, responsible drivers shift their focus frequently, depending upon traffic conditions, whether surrounded by scenic beauty or urban blight, or confronted by a roadside accident. We do not need to undo decades of Highway Beautification efforts or to shield drivers from attractive streetscapes, in order to increase traffic safety. Some have suggested to me, in fact, that the heavy gray cement wall creates a tunnel-like effect that causes anxiety for many drivers, and makes others drowsy. On the Impact of Losing a Scenic View. 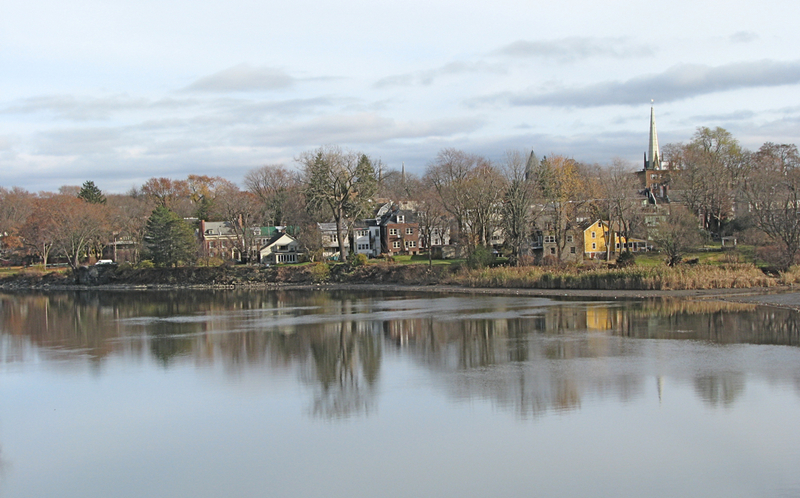 It should be obvious that the obstruction of a spectacular river view is a significant loss to a community. Indeed, several states, including Texas and California, require that all bridge projects preserve or improve scenic views. The next important question in a traditional environmental impact review is whether the negative impact can be mitigated. Here, where the initial plan totally avoided the problem, it is clear that the negative impact could have been and still can be mitigated. Removing the cement railing and replacing it with see-through railing is a readily available alternative. One lesson learned from the WGB project: Higher sensitivity to the importance of scenic views is clearly called for on behalf of State highway, bridge and transportation officials, and our local planners, who often seem oblivious to aesthetic concerns. The response of our citizenry to the loss of the Mohawk River view shows the high value we place on such opportunities to enjoy natural beauty, which are all too rare in our urban lives. 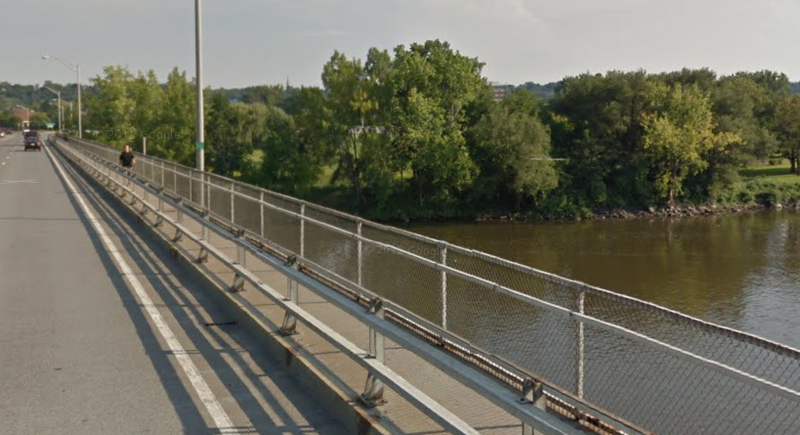 . . On August 31, 2013, a Schenectady Gazette editorial asked “Who killed the view from Western Gateway Bridge?” Our state DOT may have placed the design time-bomb that killed our view and dismantled the guardrails, but DOT put its plan in plain sight, where it could and should have been discovered and removed. That means, in my opinion, that our local leaders are at least guilty of “negligent homicide” of the view for failing to defuse that bomb. 1. 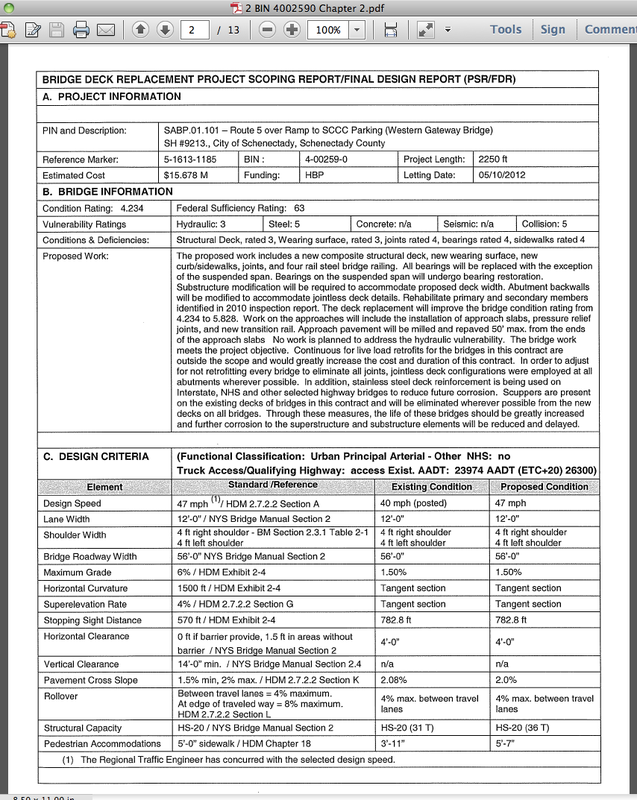 According to the DOT Project Requirements Document (April 11, 2012), the Western Gateway Bridge project required the contractor to: “Remove existing inner bridge rail and outer pedestrian fencing. At each fascia, new four-rail steel bridge rail with sidewalk and pedestrian fencing shall be provided, with transition guide-rails updated to current standards. Note: Of the 13 bridge projects approved in the package for this region that included WGB, only two called for concrete barriers, and they are two spans of the same bridge that go over I-81. Accelerated Bridge Program Phase 1B Zone 1. Even the bridges in Kubricky’s contract that go over Rt. 7 were required to have steel railings. The required bridge section shall be 68’-6” feet fascia to fascia, 6” wider than the existing width. The bridge section (looking towards Schenectady) shall consist of a 14” width for placement of the parapet, a 10’-2” sidewalk, a 5” granite curb, a 14’-0” shared use lane, two 11-0” travel lanes, a 14’-0” shared use lane, a 5” granite curb, a 5’-2” sidewalk and a 14” width for placement of the parapet. Recessed panels shall be used on both faces of the parapet. A photograph of a sample detail is posted on the project website for reference. Vertical pickets shall not be used. This photograph and the NCHRP barrier aesthetics report (also posted on the project website) shall be used as a guide in designing the proposed parapet. 1. Is Steel Bridge Railing (Four Rail) with Pedestrian Fencing an allowable alternate for Route 5 over Erie Canal? Note: The 4-rail railing with Pedestrian Fencing went from being the required railing on April 11 to being prohibited on May 15, 2012. This was 3 months before the contract was awarded to Kubricky. 2. If the four-rail in not allowable, Is bicycle railing required on top of the proposed concrete barrier? Note: Pedestrian and bicycle safety requirements are also thrown overboard, making the new configuration noticeably less safe without the removed fences and guardrails. 6. 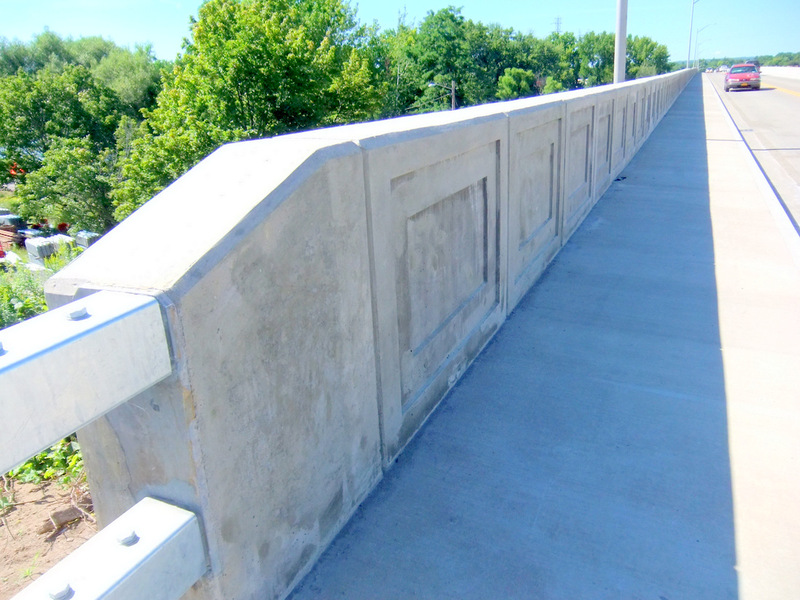 On September 8, 2013, within a few days of a public outcry and Gazette editorial about the cement wall and loss of scenic views, DOT announced that the eastern view will be preserved by installing a steel railing rather than the cement wall, but the cement wall will remain on the west side of the bridge. 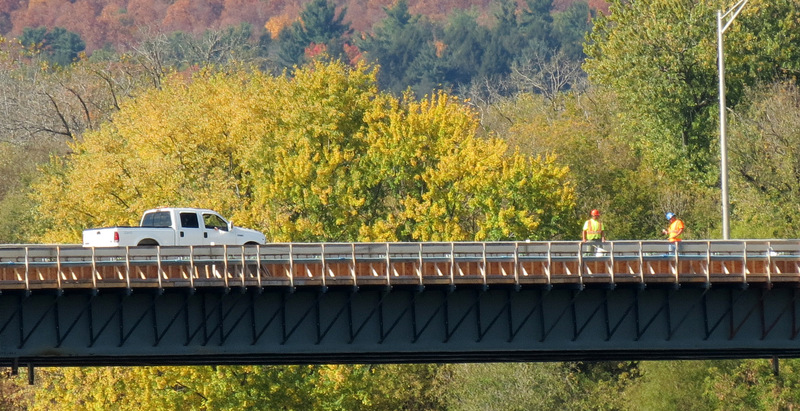 (see Daily Gazette, “View from Western Gateway Bridge partly preserved”, Sept. 9, 2013). In addition, DOT’s claim that the see-through railing is being provided on that side to give a nice view to bicyclists and pedestrians makes no sense: bicyclists and pedestrians (all except the tiniest) can readily see over the cement wall; it is drivers and passengers in conventional vehicles who cannot. Clearly, the community’s complaints led DOT to salvage the eastern views of the Mohawk. 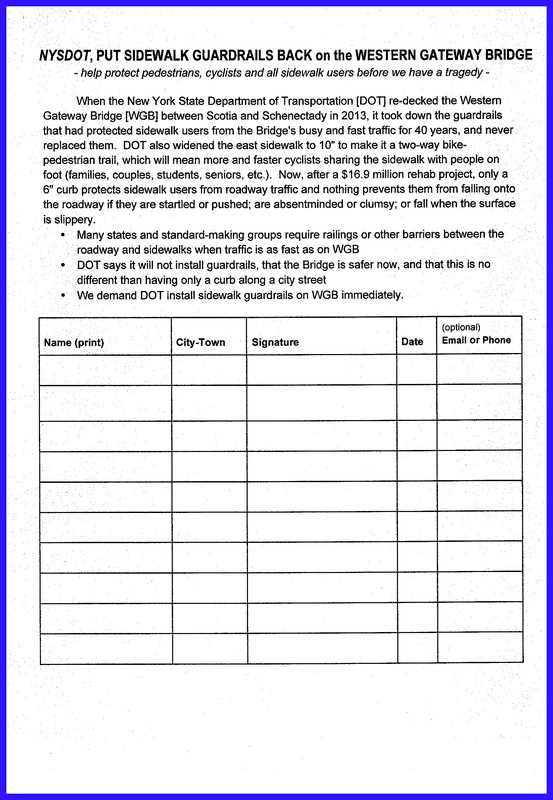 (See Gazette editorial, “DOT must do more about lost bridge view”, September 12, 2013) Such responsiveness is admirable and underscores the need for earlier community input, through public comment periods or the vigilance of local officials. Hi. I work for DMV and the whole bicycle issue bothers me. Not sure how closely you want to look at it but NYS Vehicle and Traffic Law is pretty clear that a bicycle is treated as a differently from a pedestrian. Check out Title 7 article 34 1231 and 1234 as well as article 30 1181 which refers to vehicles needing to be driven at a speed that is not too “slowly as to impede normal and reasonable movement” without the exception of a safety hazard, I believe that the way I read this and would be interested to know if I’m right- bear in mind I’m only a grade 9 MVR in the call center which is enough to know to know to check lol – is that the bridge is either not safe for bicycles because there is not a designated lane for them which requires them to ride on the edge of the road thereby causing drivers to slow and creating a safety hazard or drivers to drive unreasonably slow. Or there is no sidewalk for pedestrians and a shared path creates a safety hazard for pedestrians who are subjected to bicyclists who could in theory ride at traffic speed although supposedly required to slow down for pedestrians. This also creates an interesting situation for those who are using a wheelchair or are blind and those with baby carriages. So if it is a sidewalk then the bicycles cannot use it legally. The next thing to look at would be what the laws on the books in the county and the Town of Rotterdam say about the responsibility of bicyclists in a bicyclist-pedestrian accident. In NYC, cyclists can be charged as motorists with things like DWI and charges related to injuries and death. Thank you, Kim, for bringing up some important issues. As part of the rehabilitation project, at the request of the of the community, NYS DOT designed the roadway to have one wider “shared used” lane in each direction, that will be used by cyclists who want to ride with the traffic in the roadway. Those cyclists must obey the usual road rules. In addition, the east sidewalk has been widened to 10’2″ and designated a “multi-use” lane for cyclists and pedestrians and others using non-motorized modes of travel. 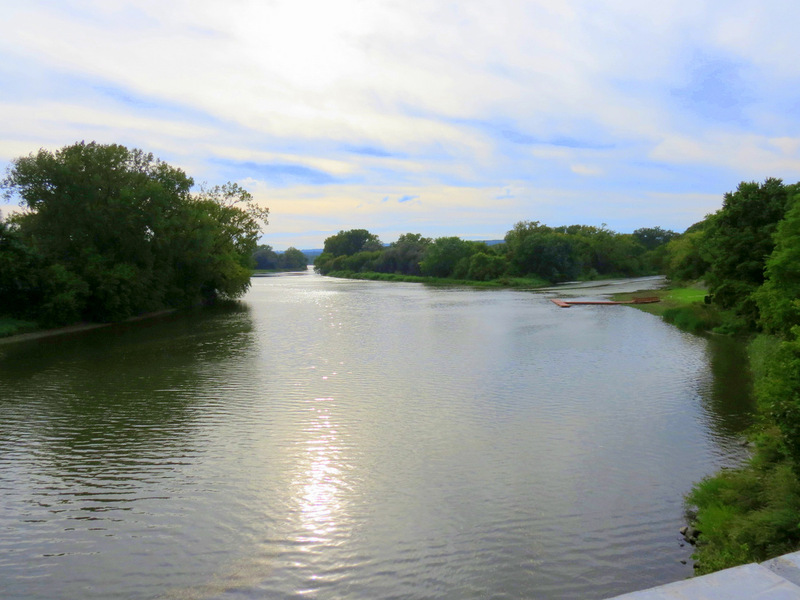 It is part of a pathway system that follows the Erie Canal. Parts of the pathway have to use sidewalks, as the bike-ped path could not be linked using only woods and parks and other unpaved paths. 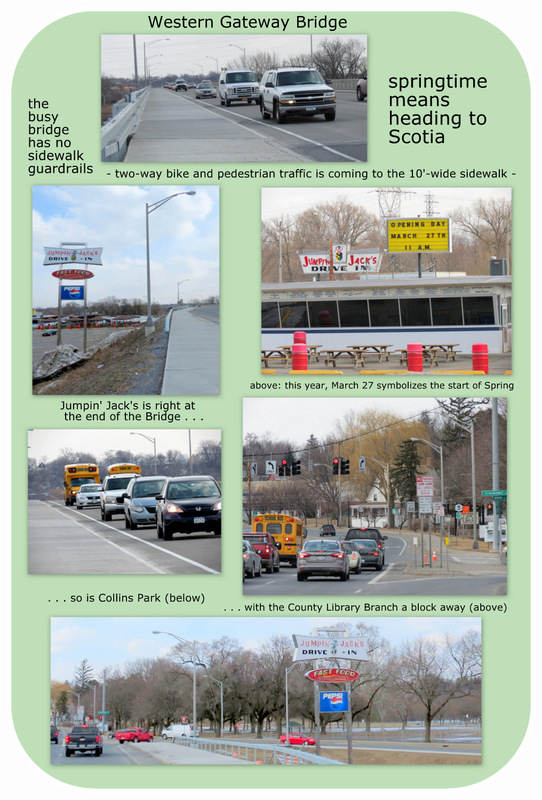 By linking the pathways on the Scotia side and the Schenectady side, the Bridge pathway fulfills a plan that has been in place for many years. Despite this, the Bridge sidewalk does not (yet?) have separate lanes for the two-way bicycle traffic. I sent a request to NYSDOT to keep the reduced speed limit of 30mph after the re opening of the reconstructed bridge on November 11th and received no response. It might take 1 1/2 minutes longer to cross at slower speeds in a car. Seems like a no brainer as thats what it is on the Scotia side and I believe it is 35 mph on the Schenectady side. I guess people in a hurry will be angry with me for suggesting the reduced speed…. Thanks for writing, Dan. Lowering the speed limit is perhaps only a no-brainer in a world where brains and reason actually get used. Just yesterday, I read an FHWA article on various concepts of speed, and it seems that lowering the limit is usually are less effective than hoped for. Drivers go far more by how the road ahead of them is laid out. Here, there is more than a half mile of clear, flat road (now nicely pothole-free) from Washington Ave. in Schenectady to Schonowee Ave. in Scotia. People will drive the 50 mph that seems to be the custom on that bridge, unless there is a very effective and consistent enforcement of a new, lower limit. But, with no shoulders, cars stopped by the police will become a hazard and cause bottlenecks. Folks who did drive 30 would end up being tail-gated and constantly passed, perhaps making things even more dangerous. At this point, I can’t think of an easy answer other than guardrails that would be likely to succeed. Putting barriers up along the sidewalk seemed like a good idea to me when I first heard it this weekend, but now I wonder how they would work on a lane already reduced to 11′, or one that was 14′ but had bicyclists and motor vehicles, with no shoulder. Guardrails aren’t perfect either as a solution, but seem the most likely to achieve our safety goals. Good luck with your petition, Da[vid]. 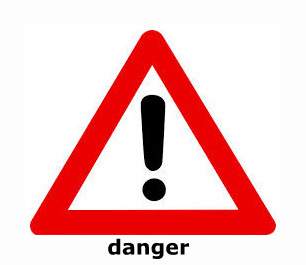 I wrote to both Hugh Farley and Jim Tedisco about the view and safety issue and received a reply from Tedisco but nothing from Farley who I believe to be the most useless politician in the area. 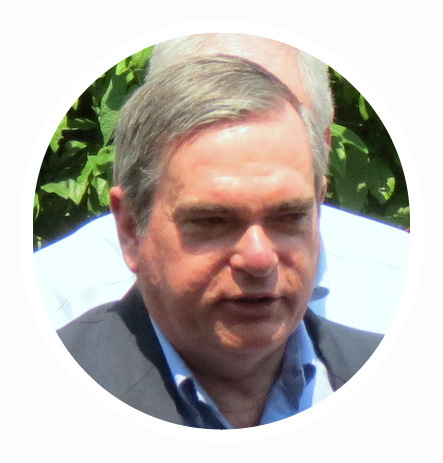 I am a retired union activist and have had dealings with many local politicians in the past. I have found the mayors of Scotia and Schenectady to be unreceptive to anything that is critical of their policies and they both tend to blame other people for the mistakes that were made on the bridge reconstruction. Please keep me posted on your fight. David, we are working on a Federal highways design guidance document and would like to ask permission to use one of your photos of the new sidewalk in a document. I understand the end product could have been better, but we just need a photo example of a retrofitted sidewalk on an existing bridge. Please let me know. Mr. Gilpin, You may use a photo of the sidewalk, with attribution. 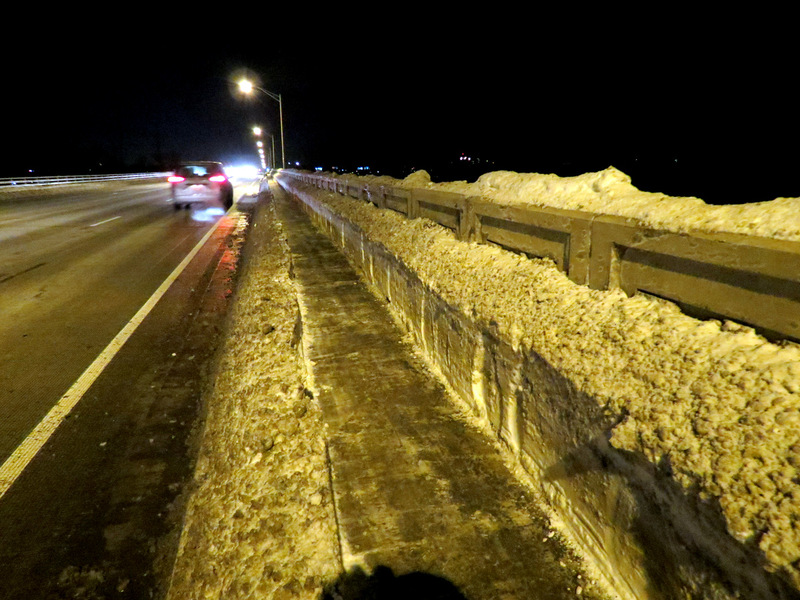 I hope the guardrail-less sidewalk on a speedy bridge does not become the norm.